I love finding cookbooks that open up a whole new world of food, recipes, chefs and authors to me, and that is what the book The Essential New York Times Cookbook: Classic Recipes for a New Century did for me! Except for an occasional Mark Bittman’s “The Minimalist” column, I never bothered to read much at the NY Times web site. That has changed after browsing this book. I borrowed a copy of this massive book from the library, and was thrilled to find some great classic recipes, plus learn a bit about food history as well as food authors I never knew. Besides the author, Amanda Hesser (Her Food52 web site was where I initially learned about this book), I was introduced to names such as Craig Claiborne, Julia Moskin, Mollie Katzen, Molly O’Neill, and Melissa Clark. The book includes 1400 recipes, and is divided into 18 chapters by food type, ie: Soups, Vegetables, Pasta & Grains, Seafood, Breakfast, Cakes, etc. The recipes inside each chapter are ordered by date, with the oldest recipes first. Each recipe includes a reference to the original publishing date plus the title of originating article. I loved that there were very old recipes from the 1800’s and early 1900’s. Just to clarify, this isn’t just a rehash of old recipes. Amanda spent years researching and testing recipes, picking the most “essential” ones. On most recipes, she adds her own commentary and sometimes even a quick historical summary of the recipe. It is truly a wonderful recipe reference book, and is recommended for every type of cook, be it newbie or experienced. I virtually read the book cover to cover and found so many fascinating recipes, and can’t wait to try about 100! A lot of recipes can be found online at the NY Times web site, along with the many original food articles. 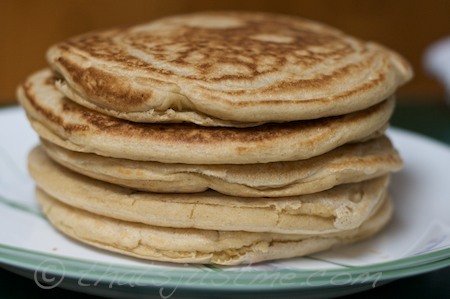 I’m dying to try making my own Ricotta Cheese, Amazing Overnight Waffles, Pepper-Cumin Cookies, Spelt-flour Crackers, German Toast, Katharine McClinton’s Foursome Pancakes, Rhubarb Ginger Compote, just to name a few. This large hard cover book is beautifully bound, but unfortunately my only complaint is there are no finished dish photos. If I were to recommend an all encompassing, basic cookbook for a newbie home cook, The Essential New York Times Cookbook: Classic Recipes for a New Century would definitely be on the Top 10 list. I would consider purchasing a copy myself, but I already have a few basic home cookbooks. I’m sadly returning my copy to the library on Monday! Hopefully my review will inspire someone else to borrow it, or purchase a copy of their own! I recently watched an episode of “the Genesis of Healing” on the Veria channel. This particular episode featured information about the life of Euell Gibbons, as well as experts discussing foraging for wild edible foods. The episode subject was very timely, since I have recently become very interested in foraging. I’m excited to pick a salad of dandelion, sorrel, and clover leaves from our backyard this season! I picked up some wild edible food books from the library this afternoon, and I have a few more requested. I’m hoping to learn more about edible wild foods, and maybe even mushrooms, although I don’t know that I’d have enough nerve to actually eat wild mushrooms! Maybe someday! A Planet Green article suggests building your knowledge and experience for 2 full years before actually eating any of your mushroom findings. That’s good advice if you can stick to it! Anyway, back to the Genesis of Healing episode. Acorns can be boiled, then dried out, then finely ground to make flour for bread, etc. Fall is a great time for to find fatty, richer edibles like seeds and nuts. The colder months (Jan-Feb) are great to pick bitter weeds, as the cold weather makes greens less bitter, more tender. Dandelions are great in winter months. Poke weed & poke salad: boil green leaves in water 3 times, changing water each time to remove toxins. It’s still very risky to eat though. Forage at least 10-15 ft from highly trafficked roads for safe, clean edibles. Learn from someone that knows what they are doing. It’s dangerous! In the show they said that a lot of other naturalists thought Euell Gibbons was a sell-out for his Grape Nuts commercials. I find it really funny (or is it ironic?) that so many jokes were made at his expense because of the commercials, (talking about eating pine cones and tree bark) and now, years later, it’s cool to forage for wild edibles again. The times they are a changing! I sometimes find Meatless Monday dinners are more delicious than meals with meat! Tonight, was one of those nights. I made a big batch of cabbage mango salad with roasted pumpkin seeds along with scrumptious yummy caramelized onion crostini. I love cabbage! In the cooler months, I always try to keep it in the fridge for salads. It’s inexpensive (so much less than lettuce, when it’s out of season) and it’s packed with nutrients, especially cancer fighting anti-oxidents & anti-inflammatory properties. 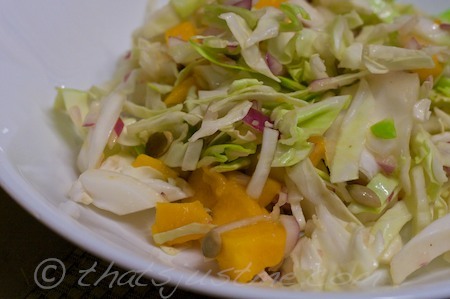 Mango was on sale this week at Whole Foods, and I still had one left this afternoon, so I googled cabbage mango salad, and found that they do pair well together! You wouldn’t think it, would you? First caramelize the onions. It takes about 20-30 minutes. You might end up with extra onions; they are still tasty as leftovers. Add to other recipes like tomato sauce, brown rice, or soups. Starting on medium heat, add 2-3 Tbsp of olive oil and 2-3 thinly sliced onions to heated saute pan. Stirring occasionally, let the onions brown a bit; turn down the stove temp to low, and cook for 15-20 minutes. When onions are golden brown and yummy, splash on 2-3 Tbsp balsamic vinegar and cook for a few more minutes. If bottom of pan is crusty and browned, add a touch of wine or water, and scrape up the bits at the bottom of the pan. Toast a few slices of whole grain bread in the oven. Once toasted, remove the bread, and top with your favorites. 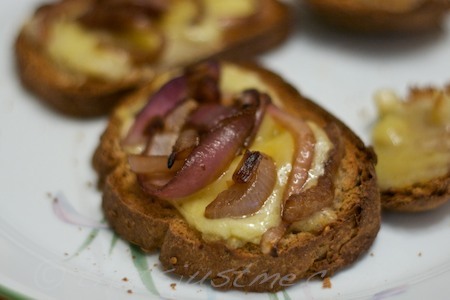 I smeared on a few cloves of roasted garlic, then topped with an aged Grafton Village cheddar cheese and a scoop of caramelized onion. Put bread back in oven and broil for a minute or two until the cheese is melted. Once summer arrives, sliced fresh tomatoes make a wonderful addition, as do sliced olives and chopped basil leaves. I also love to experiment with other cheeses like Pecorino, Manchego, fresh Ricotta, and Mozzarella. What’s up with Bob Harper endorsing processed cereal? He’s in a new TV ad for Quaker Oatmeal Squares, trying to convince America how wonderful this processed cereal is. I understand that a person needs to make a living, but it’s very disappointing that he would choose such a poor food product to promote. Shame on Bob Harper! What does 48 grams of whole grain exactly mean? Well, the total weight of one cup of Quaker Oat Squares is 55 grams. So, minus the sugar, sodium, and other assorted preservatives and chemicals, and you’ll find a net of 46 grams of whole grain. But Bob Harper doesn’t mention that a bowl of this crap also provides 10 grams of sugar, which is about a third of the suggested refined sugar consumption (Did somebody say Fruit Loops? ), along with some lovely BHT and fake food coloring. Don’tcha just love all those wonderful ingredients that you can’t pronounce! WHOLE OAT FLOUR, WHOLE WHEAT FLOUR, BROWN SUGAR, SUGAR, MALTODEXTRIN, MALTED BARLEY EXTRACT, MOLASSES, SODIUM BICARBONATE, SALT, CALCIUM CARBONATE, REDUCED IRON, SODIUM ASCORBATE, YELLOW 5, NIACINAMIDE*, ZINC OXIDE, BHT (A PRESERVATIVE), VITAMIN E ACETATE, VITAMIN A PALMITATE, YELLOW 6, THIAMIN MONONITRATE*, PYRIDOXINE HYDROCHLORIDE*, RIBOFLAVIN*, FOLIC ACID*. Compare Quaker Oatmeal Squares cereal to REAL old fashioned steel cut oats from Bob’s Red Mill, which contains, hmm, say it with me… OATS! One 1/4 cup (dry) of gives you just about the same amount of “whole grain” goodness @ 44 grams. Even when you add a tsp of sweetener and a pinch of salt, you still come up healthier with less calories, less sugar, and less sodium, compared to the Quaker Oatmeal Squares. And the bonus is you leave out the chemicals, preservatives, and other assorted ickyness that Bob Harper endorses. Too bad Bob Harper didn’t choose a company like Bob’s Red Mill to support, but then again, they don’t have a huge marketing budget like Quaker and their parent company Pepsico! Bob Harper is raking in the big bucks but, to me, he’s looking like the Biggest Loser! A few days ago, I bought a couple of bars of Vivani Organic 70% Dark Chocolate with Lemon. We had tried them months ago, and I remembered that I enjoyed eating the chocolate. Well, I guess our tastes have evolved, because now I am finding the taste to be waxy and sort of void of flavor. Not very chocolaty at all unfortunately. So, I won’t be purchasing Vivani chocolate bars again. Back to Green & Black’s until I can find another choice that tastes wonderful, but doesn’t break the bank! I’d love to find out how to make my own chocolate from 100% unsweetened blocks. UPDATED 2012-01-6: I cannot recommend Green & Black chocolate brand anymore, and deep in my heart, I think I always knew better, but I just wanted to save $. Check out the list of recommended brands of chocolate that are truly “fair-trade” – http://www.foodispower.org/chocolatelist.htm – Green & Black is on their Not Recommended list, but Vivani is on their recommended list. Hmm, I might give them one more shot perhaps! I’ve been extra hungry lately…eating extra calories. I’m not making bad food choices, but still going over my total calories. Sometimes you just need an extra “kick in the pants” to set you straight. I weighed in this morning, and was a touch over 141 pounds. I don’t think the weight I’ve gained is anything but temporary, so today, I did much better! But the good news is, I’ve been sticking to my deal for working out twice weekly, and I haven’t had a hot flash in weeks! Life is good! So, here’s my post to keep it honest….keeping it accountable! I expect to be back down to 138/139 very soon! I had a great time at my local Whole Foods for their “Customer Connection Group”. Discussing why I love Whole Foods, and what I don’t like, etc. It was really fun! And the $25 gift card was a bonus! We also received a bag full of 365 products. I can talk about food and grocery shopping all night. I love stuff like that! I was soo excited to begin watching the new Mark Bittman new cooking show, The Minimalist on the Cooking Channel. I dvr’d it this AM and just sat down to watch it. It begins with “Here we are again, spring time means softshell crabs” – he then refers the viewer to watch last seasons’ video for info on cleaning soft shell crabs yourself, and then the previously recorded clip plays. Hmm. It sounded a little awkward for a first show; then I noticed that the video quality didn’t look as “polished” as most TV cooking shows. It immediately made me think of his Minimalist video podcast. So, FYI everyone, I love Mark Bittman, but his new show the Minimalist is not NEW, it’s just rehashed and re-edited old videos from the NY Times. Not that that is a bad thing, it’s just that it shouldn’t be confused with a brand new production. Truthfully, the old Minimalist videos are great, so it’s actually a wonderful idea to recycle them so they can now been seen by a wider audience! I like that multiple videos are edited together to form a episode theme. First show is Pasta, then Asian, Steak, Latin, and lastly seafood. I’m a huge Mark Bittman fan, and I admit I’m disappointed that the show is not a new production, but I will continue to watch his Cooking Channel show. The instruction is detailed but easy to understand, and there is a lot to learn from him. I never really thought about soft shell crab, and I was intrigued to find out that they can be eaten whole! PS. Mark Bittman has a new(ish) book “The Food Matters Cookbook: 500 Revolutionary Recipes for Better Living” along with other wonderfully simple and healthy books! Check ’em out at your local library! We went up to LL Bean Outlet this afternoon to check out jeans. I had a gift card credit. They had a ton of clothes on sale @ 50% off! There was a small section of jeans, and I immediately picked out a couple of size 12 tall (and med tall). I had figured out previously that the classic fit was the best for my shape. And then on a whim, I thought, why not try on a size 10! Side note: I was a little bummed out the other day when reading a forum post. Other girls that were approximately the same weight and height as me (139 lbs, 5’8″) and they were wearing a size 8 or 10. I couldn’t understand why I was still wearing a size 12. So, anyway, back to the size 10. In the dressing room, I tried a couple of 12’s and there was wiggle room, so on go the size 10. Bam! Yes! It fit very nicely, with even a little room to spare! And mind you, this was after lunch at Chipotle Grill! Of course, at this point, I went back to the jeans shelves, and tried to find more size 10 Tall. I found one more and was thrilled that they together they were only about $18! Bargain shopper! I also found a cute little spring jacket for $8.50 and a size small turtleneck for $5. Author debbie @ That's Just MePosted on March 5, 2011 March 6, 2011 Categories Miscellaneous, Weigh inTags clothing, feelings, healthy, inspiration, jeans, LL Bean, Weigh inLeave a comment on Size 10 Jeans!